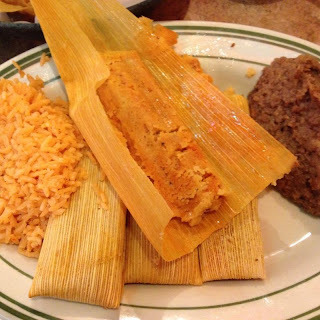 For some of the most authentic Mexican food in Chicago, I would definitely come to Nuevo Leon. They have so many options for both breakfast, lunch, and dinner! Very few Mexican restaurants come close to this place, especially when considering both taste of food and COST. It is extremely reasonable with prices usually around $8 - $9 an entree. You can't really find much better! Only think keeping it from a perfect rating is that they try to get you in and out fairly quickly and the inconvenience of needing CASH. One of their free appetizers. And yes, I said FREE! Every person at the table will get whatever the restaurant is serving that day! 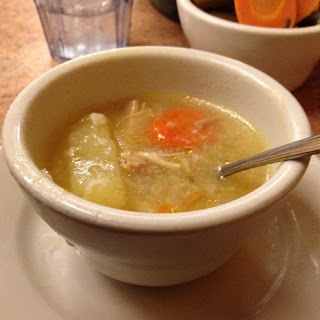 It rotates and can range from stewed pork with a tortilla to chicken soup and if you are lucky a small flauta! And of course everyone gets the normal chips and salsa too! This is my "reliable" dish... whenever someone ask for a suggestion on what to get... 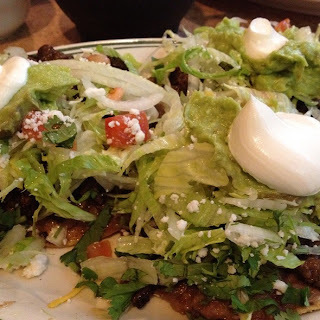 I tell them I have eaten just about everything on the menu and if you are looking for something guaranteed to be good... try these tostadas. They can be topped with just about anything and can even do two toppings. The order comes with three overloaded tostadas each with refried beans, choice of meat, lettuce, tomato, onion, cheese, sour cream, guacamole, and cilantro! I usually eat one or two at most and take the third one home. and all of it for just $6.00. It can't be beat! 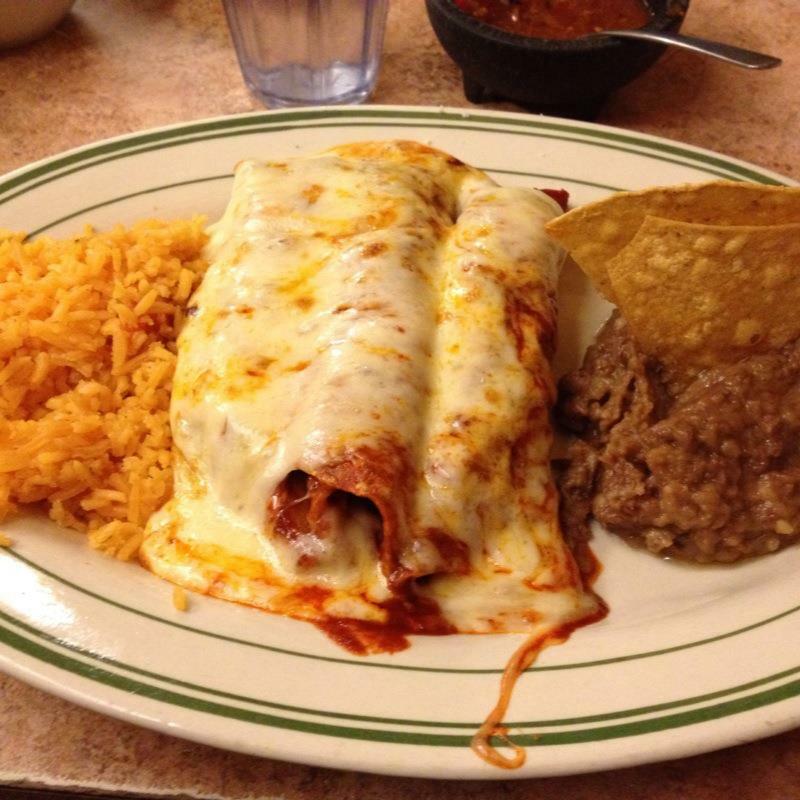 The beef enchiladas here were excellent. The order comes with three and I chose the red sauce. It wasn't too tangy and spicy as I was expecting which was a nice surprise. 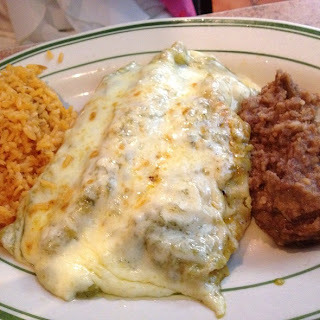 I usually enjoy the green sauce (pictured below) on my enchiladas but I wanted to try something different. The beef was ground... I was hoping they had a barbacoa option but they didn't. The rice and beans were amazing. I THINK THEY HAVE THE BEST REFRIED BEANS IN CHICAGO! I will admit I am hooked and sometimes just order a side to take home! The chicken version of these enchiladas. This time with the green sauce and also covered in plenty of cheese. These were better because the chicken was a pulled chicken cooked in some mexican spices. The rice and beans again were the greatest part of the meal and almost stole the show. I like to get a little rice, a little beans, some salsa and put them all on one of their tortilla chips! It is delicious! The Pork tamales were good but a little disappointing. They were not as moist as I like tamales to be so I had to ask for extra salsa to cover them with. The filling rotates also so depending on what day it is it might be filled with jalapeños and cheese or chicken or in my case pork. Luckily this meal came with rice and beans which made me happy! - It is BYOB so bring some Victoria! - Ask to sit in the back area... It is much nicer atmosphere and people waiting won't be bothering you at your tables! Carne Asada Dinner (this is a huge steak and you cut it up yourself and make tacos! - Drive! They have free parking and also street parking is pretty easy to find around here and cheaper than rest of Chicago! - Don't forget to bring CASH!!! it is CASH ONLY! they do have an ATM but a fee is charged!